When I talked to my mom over the weekend, she said they had a cold snap back in Pennsylvania and that she was planning to make Hamburger Soup – a dish that immediately takes me back to my childhood. There’s something that seems a little low-brow about it, but I can’t figure out why; all the ingredients are pretty standard healthy, whole foods. I guess it is because it’s simple and you can throw it together in a snap, but aren’t so many great recipes like that? There’s absolutely no trick to this soup and it never fails to make me happy. 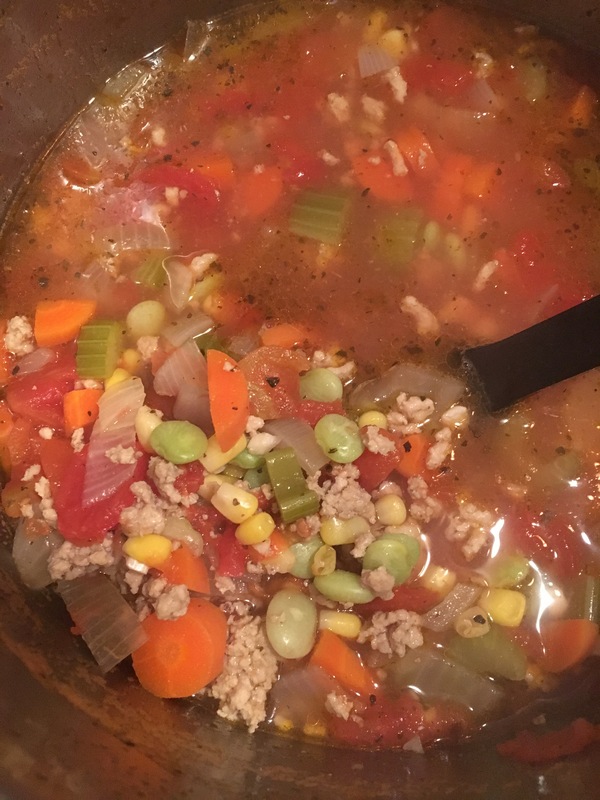 I made a few minor upgrades from mom’s version: ground chicken/turkey instead of beef, fresh vegetables wherever possible (instead of canned or frozen), and chicken stock instead of plain water. Feel free to add seasonings as you like – I use some dried oregano and basil, but I think paprika, a little chili powder and any seasoning salt blends you like would be welcome here. Think of how you want your perfect vegetable soup to taste and go with that inspiration. In my opinion, this is the perfect soup to transition from summer to autumn. Make extra; it always tastes better after sitting in the fridge overnight. Heat 2-3 TBSPs of olive oil over medium-high heat in a big soup pot until shimmering, but not smoking. Add 1 pound of ground chicken, turkey, or beef and cook/stir until brown an crumbly. Add 1 medium onion, diced; 2 medium carrots, diced; and 3 stalks of celery, diced. Stir to combine, season generously with salt, and saute until vegetables begin to soften. Add freshly ground black pepper to taste, along with any herbs/seasonings you like. Next, add a large can of diced tomatoes, along with all the liquid, and 4+ cups of chicken, beef, or vegetable stock (homemade, if possible); just add enough to bring it up to “soup” consistency. Again, stir to combine and bring to a simmer. At this point, I add fresh or frozen corn and lima beans because that’s what my mom always did, but you can add any vegetables you like. Simmer for about 15 minutes, or longer, if you aren’t in a rush. This is the kind of soup that I tend to let sit out on the stove for awhile to cool after I eat, but I always go back for a second (or third) helping.